In this first feature film of the French New Wave, one year before Truffaut’s The Four Hundred Blows, the dandyish François (Brialy, of Godard’s A Woman Is a Woman, Rohmer’s Claire’s Knee, and countless other cornerstones of 20th-century French cinema) takes a holiday from the city to his home village of Sardent, where he reconnects with his old chum Serge (Blain), now a besotted and hopeless alcoholic, and sly duplicitous carnal Marie (Bernadette Lafont). A grave triangle forms, and a tragic slide ensues. 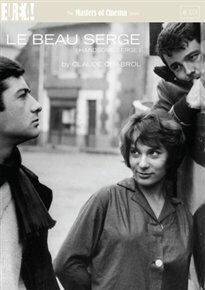 From Le Beau Serge onward up to his final film Bellamy in 2009, the revered Chabrol would come to leave a significant and lasting impression upon the French cinema — frequently with great commercial success. It is with great pride that we present Le Beau Serge, the kickstart of the Nouvelle Vague and of Chabrol’s enormous body of work, on Blu-ray and DVD in the UK for the first time.